Satisfied Clients and Customers are My #1 Priority. I have years of files filled with referrals and testimonials from past buyers and sellers. Here are just a few. Your Referrals are my #1 Source of Business and I would be honored to be YOUR TRUSTED ADVISOR. I couldn't be more impressed with your tenacity. 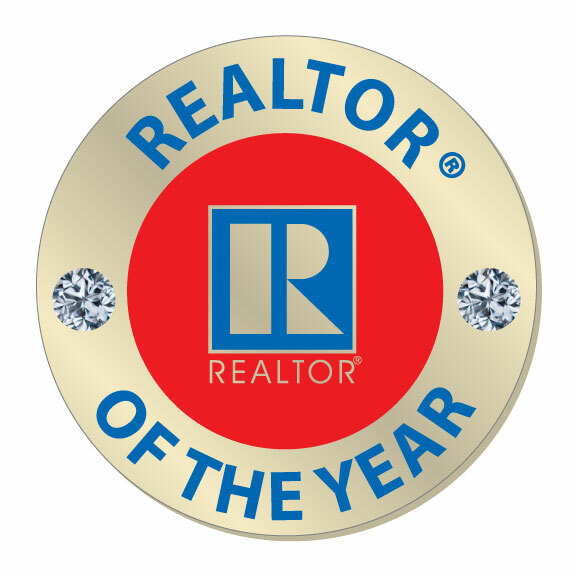 Its obvious to me that you earned being Realtor of the Year for so many reasons. I am looking forward to getting settled down there and escaping this rat race that I currently live in. Everything there is so clean and wonderful and the people are so friendly. I am looking forward to enjoying the River and my porch and just being able to relax and enjoy. Thanks so much. Alan T.
Toni~Thank you for sending me the properties to look at. I am looking forward to coming home to the States and buying property. I will be back from Iraq in July 2011. I know it is a long time from now until then, but thank you so much for your continued communications to me...even the fun ones that are not about Real Estate. I haven't even met you yet and already I feel like I know you. My wife sent me the pictures you provided and we are looking forward to you finding us someplace "PEACE-ful". Toni-Thank you so much. I have called a dozen Realtors and the only one that has continued to work hard and LISTEN to what I was wanting to buy was YOU! Congratulations! You obviously stand head and shoulders above the rest for a reason. I look forward to meeting you, looking at property and writing the contracts. You are one special lady. Thanks again. Thank you so much for showing us all those great properties. I would like you to forward this letter to your Broker. We think she should know how impressed we were with you, all the time you spent showing us properties, the care you took in making sure we were comfortable and not pushed into anything. We have been looking at real estate for a long time and many of the Agents we worked with prior to you, kind of gave up after awhile because we couldnt find exactly what we wanted. We are absolutely impressed with you, you made the entire process so much fun, you have incredible patience, we enjoyed you sharing your knowledge of the area and wanted to let you know how much we appreciated your service. I wish you worked here in Delaware so you could be our Realtor to sell our home here. Thanks so much. We look forward to staying in touch now that we are friends too. Dear Toni, We were so glad we listed our home with you. You delivered everything you told us you would and then some. Our home was advertised everywhere we looked, you continued to keep working through these very tough economic times and you are like the Energizer bunny....you just keep going and going! I know you said your work all the time, but quite honestly, I have never had a Realtor pick up their phone on a weekend...I will recommend you to everyone I know. Hey, thanks for helping us....We will come back and visit you when we are in the area again. Your truly are the real deal! It was such a pleasure getting to know you. You'll never realize what a blessing you have been to us. We just want to say "THANK YOU" for everything. We realize there were some huge obstacles to overcome at the last minute, but you took away all the stress and worry we had to finalize everything for us, as the sellers and to benefit the buyers, that were working with the other sales agent. We will be recommending you to anyone and everyone we know that needs a REALTOR! You truly have our utmost respect and appreciation and the peace of mind you gave us was so comforting. Thanks again! In all our dealings with Realtors over the past ten years, we have never met anyone as helpful and energetic as you have been. Without hesitation, we would highly recommend your service to anyone who is looking for an experienced, caring Realtor who cares about getting things done and doing them right! Thanks for taking such good care of us, we couldn't have done it without you! Dear Toni, At first I was not sure you could pull it off as I have had my properties listed with most of the Real Estate companies all over town over the past many years. I have to say, when I first met you and you explained to me about your personal Listing service I was a little doubtful, because I have heard a lot over the years and not many delivered what they said. I knew I was hiring a Realtor and not a company at that point. Then you sprung into action with your camera and your personal committment to advertising my property! I am so glad I gave you a shot at marketing my property and I was very impressed with what you did and the way you handled the whole transaction from listing to closing. The next property I buy or sell I am calling YOU again. Great Job and Thanks a lot! Hi Toni, You made buying a home so easy for my wife and I. We were grateful for how much patience you used in answering all of our questions and taking us to look at so many houses. You never pushed us into looking at something we were not interested in. We strongly recommend you to anyone looking at buying a new home. Now we know why a Realtor is so important...we never could have gotten the deal you managed to get us and the whole process was a joy! Toni, Thanks for all your help in making our "dream home" a reality. We really appreciated that you went the extra mile to get us the best price for our home. You are truly a professional. And oh by the way, you have the patience of a saint! Thank you so much for everything. We absolutely love our property and the views are indescribable. I had forgotten all about the fact that you donate a portion of your commissions to benefit cancer research until the card from the American Cancer Society came today. WOW! That was beautiful...I was touched by this and wanted to say thank you..I will recommend you to my friends here in Charlotte. I know when they come to visit they are going to want to stay. Hey Toni, Thanks so much! We are finally settling in here in Fancy Gap and we don't miss NJ at all. I just moved the folder I was using to keep up with all the properties you took us to see on all those weeks we came down to look. We must have looked at 50 houses and we picked the perfect place. Thank you so much for being there for us and really having so much patience during our search. Also, I got the card from Susan G. Komen last week. That was very nice of you to make a donation. We appreciated it. I will call you to come by and pick peaches. Thanks again. Dear Toni, I am sending a copy of this to your Broker. I am referring you to everyone I meet that even whispers a word about anything related to real estate. I can't even count how many times you called me to let me know what was going on since I listed the house with you, to all the times you came out to check on the signs, in all kinds of bad weather, to the new pictures you came out to take plus all you did on the internet to advertise the place. You are one aggressive lady and in my opinion, the hardest working Realtor I know in this town and in these times that is EXACTLY what sellers need. Thanks for all the hours you spent to help me and walk me through the process of selling my place. I appreciate it and will be telling everyone about you. You took a load off my back and I was so happy you brought a buyer that loves what I built. Dear Toni, Where do I start? Thank you for selling our home. We had it listed with another local real estate company for the longest time and nothing happened. Thanks to you we got it listed, advertised and sold. I got the card from the American Cancer Society too. Thank you for making the donation. Its people like you that make the world a nicer place. Thanks again. Dear Toni, Thanks for everything. It was a lot of fun looking and I am going to miss spending time with you having fun on the search for a place here in the mountains. My little home away from home is really great and I look forward to coming down more often. The views are amazing and I am very happy about the area too. There is plenty to do around here, although I didnt think there was going to be. I can't wait until I have more time to enjoy it all. We just wanted to drop you a quick note to let you know how much we appreciated all the time you spent with us. Although we finally found a place in Tennessee, very close to Ricks family, we just had to let you know how much it meant to us for you to show us all those homes. We realize all the time, expense and effort you put in to find us something and then we didn't even buy in Virginia. You were wonderful and thank you for making us feel at home from the moment we met you. We want to keep in touch with you as we became friends during our search process and then found out you too were involved with Boy Scouts of America for many years. We hope you and your family enjoy the holidays. Thanks again for everything. 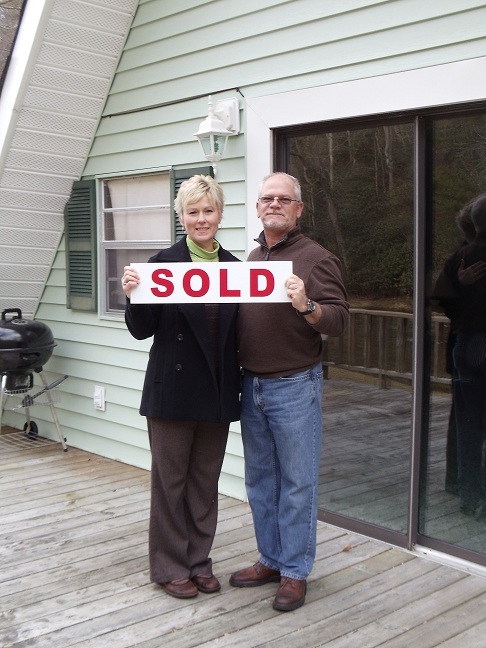 We had talked with other Realtors, but when we met Toni we knew we clicked immediately. Being from an urban as we wanted someone who was lightning fast responding to us and who worked to really understand our goals. Toni is our gal! She moves at warp speeds and stops at nothing to track down the perfect property. Her knowledge of the marketplace is beyond impressive with an in depth working database of pocket listings and homes that are only 'quietly' on the market. We know when it comes time to list our current place up there, one call to Toni and we'll be sold! From the minute I met you I knew I was in the right place. I am so thrilled with my home here in Fries and right near the River and a nice Church too. This town is just a great place to live and when I am done working I look forward to the slow peaceful pace that this area really has. I will recommend you to my friends that will be coming here to visit me. Thanks so much. I love it here. 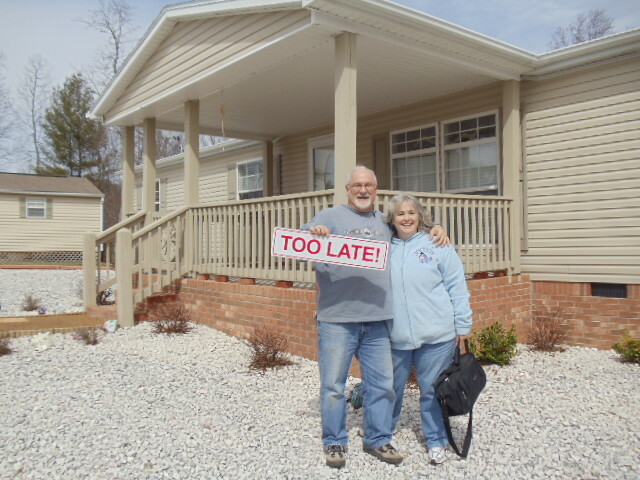 Thank you for helping us find a nice home here for my parents. We were not sure if they would adjust but we wanted them to be near us as they got older so we could help them and you made that happen. My mother felt so comfortable with you and you were so patient and caring with all of her questions. Thanks again for loving them as much as we do...its obvious you enjoy what you do selling real estate. My mother has some goodies she baked for you, so stop by. You won't believe what a 70 year old woman can do to a place-it looks great and she loves the kitchen. 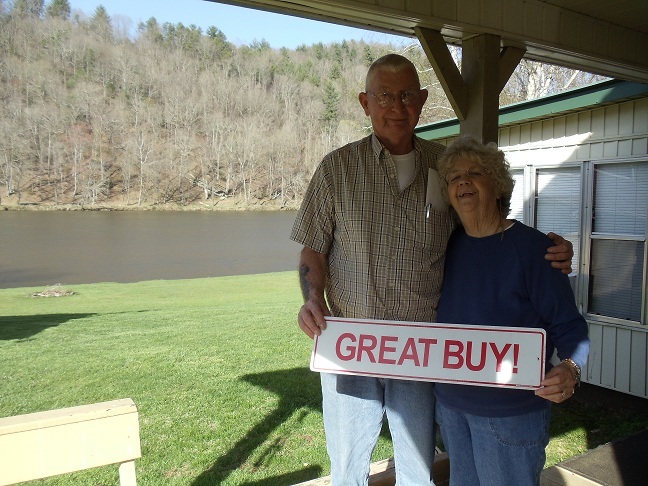 With retirement in sight, my wife and I decided we would like to buy a small parcel of land near the Blue Ridge Parkway in Carroll County, Virginia. It is our dream to build a cabin in a few years and we chose the area partially due to the fact I have family roots there. I have visited the area all my life and my wife has also fallen in love with the Blue Ridge Parkway. When we began our efforts to find a property, we quickly became frustrated. I had contacted one established realtor in the area and after no assistance, contacted a second. It became evident they were not interested in assisting us. We were small game. After a few months, I was so frustrated I called the Chamber of Commerce in Hillsville, told them of my frustration, and asked for a recommendation. Without any hesitation, the young lady I was speaking to said, Toni McSwain. She gave me a phone number and I called Toni immediately. Within an hour, Toni emailed me a list of properties fitting our criteria and asked that we note any we would be interested in seeing. During our discussion, I told Toni we were planning a trip there in two weeks and would like to meet with her. She set it up and two weeks later on a Saturday morning, we were in Toni's Office. Now to this point, we had only talked over the telephone and exchanged emails but I already had my suspicions. Upon meeting her, I can now say without any hesitation that Toni McSwain is the best friend you never knew you had who happens to be a realtor on steroids. Toni McSwain also has a sixth sense.She knows what you are looking for better than you do. In addition to the properties we had selected to visit, Toni threw us a curve ball. She found property meeting our criteria that had what I will call a "starter cabin" already established.We began our tour and stopped there first. In less than twenty minutes, my wife looked at me and I turned to Toni and said, we want it, let's go back to your office. 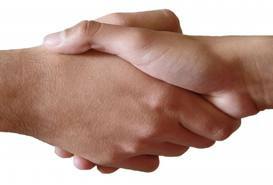 For those of you who take our advice and call Toni McSwain first,you close the deal with a hug, not a handshake. Remember, I said she is the best friend you never knew you had. We look forward to our closing and know we'll get another hug. Toni McSwain is awesome and a true professional. Call her. There is a reason the local Chamber of Commerce recommends her. Awards for Realtor of the Year come to mind. October 16, 2012 We were referred to Toni by a friend and we couldn't have been more happy with our experience. We had a tough time with one deal falling through and several other setbacks with the house we wound up purchasing, but Toni was with us all the way through. 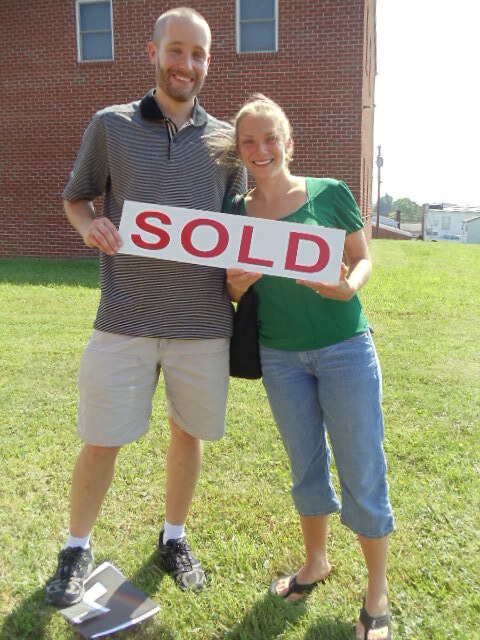 She was incredibly knowledgeable about every aspect of the deal and knew the right people to call when we had issues. She has a background in construction which was invaluable while looking at older houses. We can't recommend her enough! Call her already! Toni helped us with purchasing our first investment property. Since it was our first, we didn't have a lot of cash to put into it. Even though Toni knew her commission may not be as substantial as it would for a larger transaction, she was very dedicated to helping us find just the right property. Our first deal fell through after the home inspection was completed and yet she didn't quit on us. She is professional, moral, honest, and knowledgeable. She stays current with everything "real estate". Having dealt with a great number of real estate professionals in the region, Toni is one of the very few that I recommend. Emma Underwood Thank you Toni for taking such good care of my cousins and for becoming their friend as well as ours. That is something that is special in its own right. You are the best. Sandra Williams Thank you, Emma, for sending us to Toni. Toni, you worked relentlesly to help us sell it. The couple who bought it will take good care of it, and invited us to visit any time. It made me feel so much better to know a couple who will love it as we did will be living there. Toni, you were wonderful to work with, and I enjoyed meeting you. Thanks for going the extra mile. The best experience we ever had and we have been looking for over 2 years. Most of the agents we worked with previously gave up on us after a few times of meeting with us. But Toni was an amazing ball of energy. We sent her an ongoing list of properties to see and naturally we had no idea they were all over the place. We drove all over Virginia and she did it with a smile. She had no problem making the arrangements to show us whatever we "thought" we were going to like. None of the ones we sent her worked. So she recommended 3 properties and it turns out she knew more about what we wanted than WE DID! Very impressed with her tenacity and voracity to make us happy. We will be telling everyone about her. Thanks Toni...we are thrilled ! Toni....You called us back, you LISTENED to what we were looking for. We thought your recommendation of packing a cooler with sandwiches & drinks was great. Now we know why. You are on a mission. You showed us the first listing and we fell in love with it. I thought this was going to take months to find land we wanted to own. Thanks for making the HUNT so FUN! Can't wait to camp on my own land. Really appreciate all you did for us. Toni's knowledge and professional manner made working with her a pleasure. I would highly recommend her. We spent nearly a full day working our way through commercial properties in Galax, VA. So I am home! Home here in Fancy Gap, VA, with many thanks to you. You were so thoughtful to leave me the card and the wind chimes to sweeten up and welcome me to my new abode. I guess all I talked about for two years was sitting out on my deck and imagine myself listening to some wind chimes, so picture the smile on my face when I opened the door after closing to find them sitting here! You put more into your work than any other Realtor I had previously worked with, or should I say, tried to work with. They all gave up on me because I was so indecisive for so long. Looking back, I realize none of them were DEDICATED enough to hang in there with me. After all, this is a big deal me moving from the state of Washington to Virginia. Your willingness to gather, hunt, search and send me real estate information, answers to my many silly questions and put up with my lack of knowledge for over two years. I wanted to send this note to you and let you know how incredibly happy I am here. You really do put your heart and soul into your career. I realize that with all the hours you spent for two years, all the gallons of gas, all the time going in and out of homes, that when all was said and done you didnt make much money, but in this day and age your CUSTOMER SERVICE was above and beyond what a host of others didnt provide. Crossing paths in life with you was the best thing that ever happened to me and I am proud to now call you my friend and neighbor...Thanks Toni, I am so incredibly at peace here on my hill. Just wanted to scribble this quick note to tell you "THANKS". You got me a great deal even though I didnt think I was ever going to find something in my price range. Sorry this took so long to send. Not a guy of many words so let's just leave it at that. You know where to find me. Words cannot express how thankful I am to have you as my Realtor friend. My moms eyes would have gotten so big to have known someone had done what you did in her memory. I will never forget this. LOOK NO FURTHER: Extremely knowledgeable,super helpful, always available. Toni McSwain is the hardest working realtor I have ever had the pleasure of knowing. Also, a lot of fun and always happy to help in any way. We hope you enjoy these flowers as a small gesture of our appreciation. For all your help & diligence in making our closing a success. Ray and I appreciate your devotion to us & for your attention to details. You are amazing. Please enjoy this small token of our gratitude and appreciation for all the countless hours you spent in selling our home. We didn't think it would ever sell. When we interviewed you and a host of other local Realtor's, you were the only one that talked about a strategy. The photos of our place were outstanding. We had it listed for 8 years with 4 other companies local in your area, before we found you! No one did anything, at least it appeared nothing was being done, the sign sat getting rusty and our farm was only shown one time in all those years. We know this was a huge task you took on and Jim was pretty tough on you. But YOU DID IT. I could cry thinking about the whole thing looking back. The day you left here Jim said, "wow, she's one tough cookie". Best "cookie" I ever had. Thank you for not giving up and for putting up with us. Toni has done everything she said she would to in an effort to sell our property. She has been very professional in her business manner and in a down economy, has performed flawlessly. Toni has been very responsive to our questions and concerns. She has treated us with a skillful blend of professionalism and compassionate understanding as we placed our trust and our home and in her hands. She is a true advocate for her clients, and we hope to call her "friend" long after our business is complete. In 2010, I was very fortunate to meet Toni through the miracle of the "business internet". Not only has she become a fantastic Customer since then, she has become a personal inspiration and business role model. If anyone in the Virginia or Carolina area ever needed a Realtor, or to learn how to treat Clients and Customers with the utmost care, compassion and respect, Toni McSwain is the one! Her passion and dedication for each and every one of her Clients can be seen 24/7. I would recommend her without hesitation, and if I or anyone in my personal family or business family ever needs real estate services in Virginia, without a doubt, Toni will be my first call. With the housing market down in the muck, Toni McSwain met with us & brought very useful information such as area taxes, 8 listings of homes comparable to ours, etc. she put the listing out there on Tuesday & sold our house that Saturday. 7 days start to finish! Toni's enthusiasm & positive attitude were key in that fast turn around! Toni Cioffi-McSwain went above and beyond when I made my first home purchase. She used her impressive skills and talent to help me get the best deal possible. She is a remarkable realtor whom I would use again and highly recommend. Toni McSwain was our realator for our Mom's home at 426 Sheep Grove Rd, Fries, VA, 24330. She is the most energetic person I have ever met, she worked tirelessly and our home was sold in a couple of months. There were other comparable homes in the same area that had been on the market for many months. Toni helped with reputable contractors to help with repairs the buyers requested. She is professional, replied to any questions in seconds, knowledgable, and relentless in her pursuit to handle anything that needed to be done. I would recommend her above all others to anyone who has a home they wanted moved quickly. From the first phone call Toni McSwain went above and beyond to help me find exactly what i was looking for. She was always there to help and more than willing and flexible when plans changed. Always there to greet you with a kind word and a smile Miss Toni has my vote for best realtor ever!! Kudos!!! Thanks so much Toni for working in our behalf to get this purchase completed. I'm thrilled, really thrilled, to know we have this house. Bob will get onto securing financing as soon as you can send some names of banks. We're rather in limbo until then. I used to sell real estate in Florida and recognize a top-notch agent when I'm dealing with one. We were very fortunate you were our agent. Dear Toni, I have been looking for an agent that was willing to do whatever it took to help my wife and I find something in an area I knew absolutely nothing about. I had no idea I was going to get a package in the mail filled with tourism pamphlets, maps, helpful information to sit back and look over and enjoy from you. Everything in this packet you sent from the Blue Ridge Parkway to the Appalachian Trail and it was all right there in your area. My wife and I had no idea I was talking to someone who would go the "extra mile" to provide us with EXACTLY what we were hoping for. I cant begin to tell you how many times I sent inquiries through Zillow and noone ever called me back. I cant be sure, but I think it was about 60 seconds when I hit SEND and the next thing I knew, my phone was ringing and YOU were on the other end, responding to my request for information!!! My wife still cant get over it...I've been sending out (begging agents) to call me for months. Now that we have been looking at properties with you, we are totally convinced YOU ARE the BEST REALTOR for a reason. Thank you for everything you are doing on our behalf. We are looking forward to coming back in a few weeks and wanted to let you know how HAPPY we both are to finally have found OUR REALTOR...we cant wait to move there..hurry and find us our new home. Reginald and Vincenza K.